Author of such classics of 20th-century popular American literature as Tobacco Road (1932) and God's Little Acre (1933), Erskine Caldwell was something of a celebrity nearly all his life. But he was also a serious writer, one whose merits are as considerable as they remain underexplored. In the 1930s, he startled the literary world with his frank portrayals of the poor whites of the South. Beginning in the early 1940s, critics grew suspicious that he had exhausted his originality and his talent. In the late 1960s, some scholars began an effort, which continues intermittently today, to reconsider Caldwell's achievement. This collection of reviews, critical essays, and book excerpts provides a chronological portrait of the often contradictory and unfailingly colorful critical response to Caldwell from 1931 to the present. The 57 pieces collected in this volume were chosen to represent all sides and perspectives in the evolving critical opinion of Caldwell's work. The items are grouped in sections representing three chronological periods that encompass the prevailing critical moods concerning his writings: the 1930s, when readers of many persuasions found him promising and held out great hopes for his development; 1940 to 1968, when increasing critical scrutiny led to his dismissal as a writer of significance; and 1969 to the present, when there have been several substantial efforts to reconsider Caldwell's achievement. 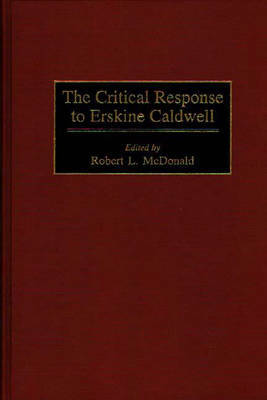 An introductory essay argues that Caldwell remains largely absent from our critical consciousness today because of a prevailing willingness among academics to rely on largely negative received opinions about his books in place of primary experience with them. The introduction is followed by a chronology, and the volume concludes with an extensive selected bibliography.